By looking at various climate phenomena I got the impression that the global waring potential of methane might eventually be vastly higher then as the current estimations seem to indicate. With vastly I currently imagine something at least a factor 10, which would put methane on a similar if not higher level as a cause for global warming as CO2. "The LBL model is used to calculate optical depth (Edwards1992) and radiative fluxes are calculated as in the work of Myrhe and Stordal (1997). The NBM is the 10 cm^(-1) narrow band radiative transfer scheme of Shine (1991). In this study, the scheme is used with spectral band data from HITRAN-1996 except for CFC 11 which uses the average crosssection from Christides et al  and CFC-12 which is from HITRAN-92. The BBM includes about 50 gases about all the trace gases of importance for modelling of the terrestial radiation. This model is also described in Myrhe and Stordal . The LBL model and the BBM use spectrocopic data for the halocarbons from the HITRAN96 database and for the other WMGG as in Myrhe and Stordal (1997)." Table 2 lists for CH4 the NBM and the NBM altered model and the BBM model. I don't know though wether this listing is exhaustive. That is wether this list reflects all models used for determining the methane radiative forcing. Let's assume this is so. "For CH4 and N2O an approach based on Donner and Ramanathan (1980) is taken." "The present analysis includes the 1306 cm^-1 band of CH4 and the 589 and 1285 cm^-1 bands of N2O. Both these species have several other bands between 2000 and 6000 cm^-1 (Cess and Chen 1975; Kunitomo et al 1977) whose contributions to terrestial climate are negligible." This sounds as if for the BBM model the used spectral methane data was the 1306 cm^-1 band, finally other bands which could have been included are not mentioned. ? Concluding for the calculations of the radiative forcing of methane which entered AR5 it seems only spectral data in the range from 0-6185 cm^-1 was taken into account. Is that correct? "In the BBM and NBM the shortwave radiative fluxes are obtained from the Delta-Eddington model (Briegleb 1992b). Eighteen spectral intervals are used from 0.2 to 5.0 mikrometers with seven shortwaves with 0.35 mikrometers to represent ozone absorption: one in the visible (0.35 to 0.7 mikrometers) and ten in the near infrared (0.7 to 5 mikrometers) for O2, H20 and CO2 absorption. Molecular and cloud droplet scattering are included. The model gives an accurate approximation to shortwave scattering and absorption based on comparision with higher resolution and more accurate scattering calculations." By this paragraph it is unclear to me which spectral data entered the CH4 calculations - by this paragraph it doesn't sound as if any shortwave absorption for CH4 was taken into consideration, even not the near infrared but as said this is a bit unclear. But in particular the paragraph says that no spectral data below 200 nm= 0.2 mikrometers, like the above ones for CH4, was taken into account. "Radiative forcing based on the UARS-measured distributions of CH4 and N2O are 3% higher,..."
The spectral data of HITRAN 2004 which includes near infrared spectral data is summarized here: http://vpl.astro.washington.edu/spectra/ch4hitran2004images.htm One sees that the sizes of the bigger peaks in the 7000 and 8000 cm^-1 range are very roughly a factor 1000 smaller than the 1300 cm^-1 band (while the width is somewhat similar), so this doesn't look as if there is a big influence from near infrared, but then this is at higher energies. As said I don't know anything about the models so I can't really tell what difference this makes. But now Methane has also bands in the UV range. Concluding my question: Given that my impression that higher frequency spectral data is in current calculations of radiative forcings not included is correct then are there any evaluations concerning the influence of the higher frequency spectral data on the radiative forcing of methane? Is a factor 10 for the global warming potential possible? Comment Source:-------------------- Radiative forcings and global warming potentials of 39 greenhouse gases A.K. Jain, B. P. Briegleb, K. Minschwaner, D.J. Wuebbles J. of . geophys. Research, Vol 105, no. D16 p. 20,773-20,790 August 27, 2000 http://climate.atmos.uiuc.edu/atuljain/publications/2000JD900241.pdf On p. 20,779 they write: > "In the BBM and NBM the shortwave radiative fluxes are obtained from the Delta-Eddington model (Briegleb 1992b). Eighteen spectral intervals are used from 0.2 to 5.0 mikrometers with seven shortwaves with 0.35 mikrometers to represent ozone absorption: one in the visible (0.35 to 0.7 mikrometers) and ten in the near infrared (0.7 to 5 mikrometers) for O2, H20 and CO2 absorption. Molecular and cloud droplet scattering are included. The model gives an accurate approximation to shortwave scattering and absorption based on comparision with higher resolution and more accurate scattering calculations." By this paragraph it is unclear to me which spectral data entered the CH4 calculations - by this paragraph it doesn't sound as if any shortwave absorption for CH4 was taken into consideration, even not the near infrared but as said this is a bit unclear. But in particular the paragraph says that no spectral data below 200 nm= 0.2 mikrometers, like the above ones for CH4, was taken into account. The result in the radiative forcing calculations are in this article at the end of the article: >"Radiative forcing based on the UARS-measured distributions of CH4 and N2O are 3% higher,..." The spectral data of HITRAN 2004 which includes near infrared spectral data is summarized here: http://vpl.astro.washington.edu/spectra/ch4hitran2004images.htm One sees that the sizes of the bigger peaks in the 7000 and 8000 cm^-1 range are very roughly a factor 1000 smaller than the 1300 cm^-1 band (while the width is somewhat similar), so this doesn't look as if there is a big influence from near infrared, but then this is at higher energies. As said I don't know anything about the models so I can't really tell what difference this makes. 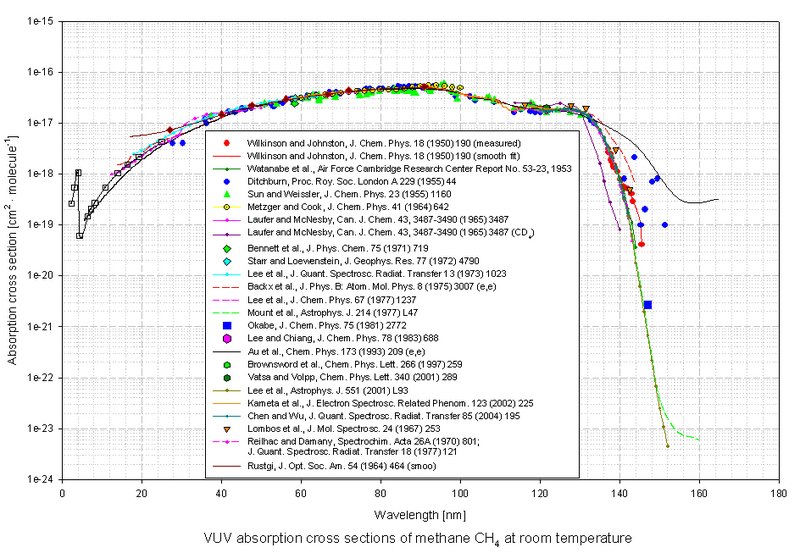 But now Methane has also bands in the UV range. I have sofar though no comparision of the absorption strengths with spectrum the UV regime, since I haven't yet figured out the HITRAN units. 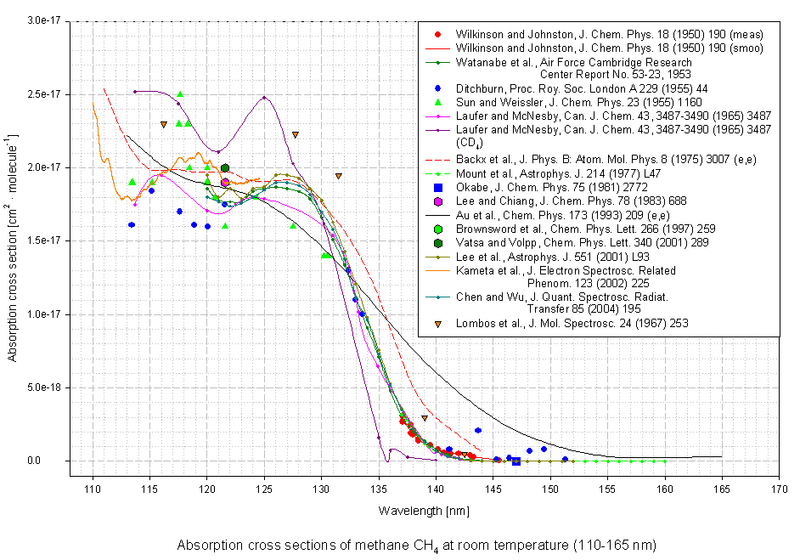 Here is an image of UV absorption crosssections of methane in the UV regime (110 nm translate to approx 90000 cm^-1: http://joseba.mpch-mainz.mpg.de/spectral_atlas_data/cross_sections_plots/Alkanes+alkyl%20radicals/Alkanes/CH4_VUV_110-165nm_lin.jpg Here even shorter wavelengths: http://joseba.mpch-mainz.mpg.de/spectral_atlas_data/cross_sections_plots/Alkanes+alkyl%20radicals/Alkanes/CH4_VUV_2-165nm_log.jpg Concluding my question: Given that my impression that higher frequency spectral data is in current calculations of radiative forcings not included is correct then are there any evaluations concerning the influence of the higher frequency spectral data on the radiative forcing of methane? Is a factor 10 for the global warming potential possible?
" Given that my impression that higher frequency spectral data is in current calculations of radiative forcings not included is correct then are there any evaluations concerning the influence of the higher frequency spectral data on the radiative forcing of methane? Is a factor 10 for the global warming potential possible?" I don't know. The fact that atmospheric methane concentrations has shown changes in slope over the the years suggest that one could track correlations of the global temperature against methane. I have tried teasing signal this out with my CSALT multiple linear regression tool, but the effective CO2 seems to bury any other GHGs in the noise. That's why it's called an effective CO2 -- it acts as a leading indicator and its not a bad approximation to suggest that the other GHGs will rise and fall along with the CO2 average value. If a big burp of methane did occur, it could have an effect, but quickly the methane would reduce to CO2 and H2O through biological activity. The jury is out whether the activation energy of methane clathrates is that much bigger than that of CO2 stores. That is the only way that methane would release faster than CO2 with rising temperatures. That's elementary physical chemistry. Comment Source:> " Given that my impression that higher frequency spectral data is in current calculations of radiative forcings not included is correct then are there any evaluations concerning the influence of the higher frequency spectral data on the radiative forcing of methane? Is a factor 10 for the global warming potential possible?" I don't know. The fact that atmospheric methane concentrations has shown changes in slope over the the years suggest that one could track correlations of the global temperature against methane. I have tried teasing signal this out with my CSALT multiple linear regression tool, but the effective CO2 seems to bury any other GHGs in the noise. That's why it's called an effective CO2 -- it acts as a leading indicator and its not a bad approximation to suggest that the other GHGs will rise and fall along with the CO2 average value. If a big burp of methane did occur, it could have an effect, but quickly the methane would reduce to CO2 and H2O through biological activity. The jury is out whether the activation energy of methane clathrates is that much bigger than that of CO2 stores. That is the only way that methane would release faster than CO2 with rising temperatures. That's elementary physical chemistry. but the effective CO2 seems to bury any other GHGs in the noise. I got meanwhile an email answer from Gunnar Myrhe. At least for this week he is already packed with meetings, but he said he would comment on this if he finds the time to do so. So let's see. I sofar got no answers from the others. Comment Source:>but the effective CO2 seems to bury any other GHGs in the noise. I got meanwhile an email answer from Gunnar Myrhe. At least for this week he is already packed with meetings, but he said he would comment on this if he finds the time to do so. So let's see. I sofar got no answers from the others. "First, you have correct regarding the formula in the Supplementary Material of Chapter 8 AR5. The publisher introduced the unfortunate error in the final production of the Supplementary. An Errata was published soon after the publication, and can be found here: http://www.climatechange2013.org/images/report/WG1AR5_Errata_17042015.pdf"
"It is also correct that the CH4 formula for CH4 includes only absorption bands in the infrared part of the spectrum. " " Thank you for pointing to the UV absorption by CH4. The absorption is occurring at very short wavelengths and would therefore only be of relevance at very high altitudes . At these altitudes the abundance of CH4 is very low due to other sinks. I think therefore this UV absorption would be of very small importance. A solar absorption in the upper atmosphere would lead to a negative radiative forcing since less solar energy would be available for the troposphere-surface system important for the surface temperature." At 10 km (top of the troposphere) virtually all radiation below 290 nm has been absorbed. All radiation below 100 nm is absorbed in the thermosphere above 100 km. O2 absorbs strongly at wavelengths between 100 and 200 nm and also in a weaker band between 200 and 245 nm. O2 absorptions attenuate incoming UV radiation of less than 200 nm above an altitude of 50 km. Light of wavelengths of between 200 and 300 nm is strongly absorbed in the stratosphere by ozone (O3) and transmission of radiation of wavelengths less than 290 nm is negligible below 10 km. Between 300 and 800 nm the stratosphere is only weakly absorbing and most of the solar radiation at these wavelengths is transmitted into the troposphere. There is little tropospheric absorption below 600 nm but H2O and CO2, at high tropospheric concentrations, deplete the near IR part of the incoming solar flux appreciably. Hence, surface solar irradiance is dominated by visible wavelengths. I currently try to find out more about possible other UV lines which might not have been included in the MAINZ spectral data. Comment Source:Gunnar Myrhe answered me yesterday night. He wrote about the typo: >"First, you have correct regarding the formula in the Supplementary Material of Chapter 8 AR5. The publisher introduced the unfortunate error in the final production of the Supplementary. An Errata was published soon after the publication, and can be found here: http://www.climatechange2013.org/images/report/WG1AR5_Errata_17042015.pdf" About the missing spectra: >"It is also correct that the CH4 formula for CH4 includes only absorption bands in the infrared part of the spectrum. " He was though not concerned about the UV lines which I had pointed out to him: >" Thank you for pointing to the UV absorption by CH4. The absorption is occurring at very short wavelengths and would therefore only be of relevance at very high altitudes . At these altitudes the abundance of CH4 is very low due to other sinks. I think therefore this UV absorption would be of very small importance. A solar absorption in the upper atmosphere would lead to a negative radiative forcing since less solar energy would be available for the troposphere-surface system important for the surface temperature." And indeed I meanwhile found lecture notes which deal with this questions <a href="http://www.cas.manchester.ac.uk/documents/hughcoe/lecture22007%5B1%5D.pdf">here:</a> >At 10 km (top of the troposphere) virtually all radiation below 290 nm has been absorbed. All radiation below 100 nm is absorbed in the thermosphere above 100 km. O2 absorbs strongly at wavelengths between 100 and 200 nm and also in a weaker band between 200 and 245 nm. O2 absorptions attenuate incoming UV radiation of less than 200 nm above an altitude of 50 km. Light of wavelengths of between 200 and 300 nm is strongly absorbed in the stratosphere by ozone (O3) and transmission of radiation of wavelengths less than 290 nm is negligible below 10 km. Between 300 and 800 nm the stratosphere is only weakly absorbing and most of the solar radiation at these wavelengths is transmitted into the troposphere. There is little tropospheric absorption below 600 nm but H2O and CO2, at high tropospheric concentrations, deplete the near IR part of the incoming solar flux appreciably. Hence, surface solar irradiance is dominated by visible wavelengths. About the near infrared he wrote: >"Near-infrared absorption by CH4 has been investigated earlier and I know it is under further investigations. It is not obvious whether the near-infrared absorption leads to a positive or negative forcing, since it depends if the absorption occur in the troposphere or stratosphere. " I currently try to find out more about possible other UV lines which might not have been included in the MAINZ spectral data. (In my former academic surrounding things which appear uncited in lecture notes were called "folklore", i.e. those were facts which were usually proven and justified many, many times) I mostly wanted to get a look into the measurement methods, which lead to the above assertions and be able to judge about possible simplifications which sometimes takes place in educational material. Like now Jan Galkowski just pointed to an article which I can't access but which seems to talk about large circulations of ozone into tropospheric layers. The downward transport of stratospheric ozone is an important natural source of tropospheric ozone, particularly in the upper troposphere, where changes in ozone have their largest radiative effect. If someone feels they need a climate background to understand the science in these, I often recommend Ray Pierrehumbert's textbook, Principles of Planetary Climate or David Archer's Global Warming: Understanding the Forecast, which is also accompanied by an online course, with lectures. Comment Source:+nad That article was incidental to ozone, and had nothing at all to do with CH4. If you'd like to understand methane better, I'd read and understand: [Short-lived climate pollution](https://goo.gl/mG3AGl) [Short-lived climate pollution (supplement)](https://goo.gl/YY2QFc) [Disentangling the effects of CO2 and short-lived climate forcer mitigation](http://goo.gl/dJnCnp) [Much ado about methane](http://goo.gl/5NMdNv) If someone feels they need a climate background to understand the science in these, I often recommend Ray Pierrehumbert's textbook, _Principles_ _of_ _Planetary_ _Climate_ or David Archer's _Global_ _Warming_: _Understanding_ _the_ _Forecast_, which is also accompanied by an [online course](http://forecast.uchicago.edu/), with lectures. My question here is to which extend Ozone is blocking UV. I still dont know whether methane is absorbing in the 170nm-750nm region, I have written an email with this question to people at the Spectral Atlas at MPG in Mainz but if it does then the question of Ozone may become relevant. It is also that this example shows me that the "folklore" that the high energy radiation (and there is a methane absorption in this spectral range!) is blocked before the troposphere needs eventually also be taken with a grain of salt. Although long-term mitigation of methane and hydrofluorocarbons are integral parts of 2 °C scenarios, early action on these species mainly influences near-term temperatures and brings small benefits for limiting maximum warming relative to comparable reductions taking place later. and similar content in the other links you cited. Comment Source:+Jan My question here is to which extend Ozone is blocking UV. I still dont know whether methane is absorbing in the 170nm-750nm region, I have written an email with this question to people at the <a href="http://joseba.mpch-mainz.mpg.de/spectral_atlas_data/cross_sections_plots/Alkanes+alkyl%20radicals/Alkanes/CH4_VUV_110-165nm_lin.jpg">Spectral Atlas at MPG in Mainz</a> but if it does then the question of Ozone may become relevant. It is also that this example shows me that the "folklore" that the high energy radiation (and <a href="http://joseba.mpch-mainz.mpg.de/spectral_atlas_data/cross_sections_plots/Alkanes+alkyl%20radicals/Alkanes/CH4_VUV_110-165nm_lin.jpg">there is a methane absorption in this spectral range</a>!) is blocked before the troposphere needs eventually also be taken with a grain of salt. That is for the case that UV absorption (and near infrared) largely alters the radiative forcing of methane I would eventually rather strongly disagree with whats written <a href="http://www.pnas.org/content/111/46/16325.full">here:</a> >Although long-term mitigation of methane and hydrofluorocarbons are integral parts of 2 °C scenarios, early action on these species mainly influences near-term temperatures and brings small benefits for limiting maximum warming relative to comparable reductions taking place later. and similar content in the other links you cited.